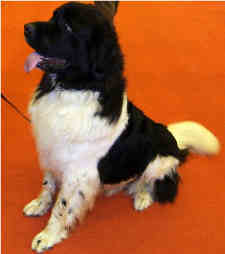 The accepted colours in the United Kingdom for the Newfoundland dog breed are black, with or without a white blaze, brown or bronze and white and black, which colour is also known as Landseer. The black and white newfoundland got his name from Sir Edwin Landseer, who painted many pictures of the black and white giant dog. The Landseer is mostly white, usually with black hind quarters. The black dog sometimes has white paws, which is also acceptable, and I have seen one with the tip of his tail in white. This is very attractive, but I don't know how well he would do in the showring. People usually think of the newfie as being black and I once had an interesting conversation with someone who thought that a well known local newfie must be a cross breed because he was brown! I put him straight of course. Be very aware of people trying to sell a "rare" newfoundland dog. I saw an ad on the internet last year for landseer newfoundland puppies, very rare colour, £1800. That is well above the price of a good pedigree puppy and the puppies were brown and white, not black and white. 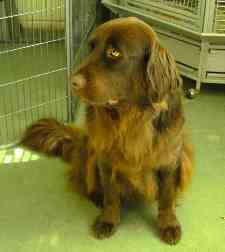 I am told that this colour is the result of crossing a landseer (black and white) newfie with a brown one. The colour is not accepted by the Kennel Clubs so, far from being rare, it is in fact an inferior colour. Of course, if you have no interest in showing and do not mind the unacceptable colour, there is nothing wrong with the dog, but it is doubtful that this sort of "breeder" will have carried out any health tests. This sort of rarity should be a lot cheaper, not more expensive. The American Kennel Club also includes grey in its breed standard. I have never seen a grey newfoundland dog, they are not something one is likely to find in the United Kingdom. However, should you be offered a grey Newfie as a rare colour in the UK, take note. This colour is not accepted as breed standard by the UK Kennel Club.